Many parts of Central America are like a paradise on earth and Nicaragua is certainly no exception. From lazy hammock sunsets over the Pacific ocean and jungle treks to gently smoking volcano craters or beautiful rivers punctuated by waterfalls and gorges all the way to sipping piña coladas on the boulevard while being serenaded by mariachis or tasting hand-made organic chocolate made by the person standing right in front of you. Between the members of PWB Nica we’ve managed all of the above and more on top of 9 days of boot camp, 60 days of teaching and 30 shows in less than three months. We’ve seen the country from the far north to the far south, and from the Pacific west coast to the Caribbean islands off the east. We didn’t quite make it into the rainforest, but we have spent time in the 3 biggest cities, many smaller towns and villages, with a few trips into the middle of nowhere for good measure. Of course it’s not all paradise, and we’ve seen some of the darker side of life too – it’s one of the things that is unmissable on a PWB tour as it brings you in close contact with those who are pushed to the edges of society, even in a land that is fertile, beautiful, friendly and open. There’s a incredibly high poverty rate and many children live on the streets, either earning money through begging, crime or prostitution or escaping the realities of life in a bottle of glue. Even for those with homes, a lot of them have very little to look forward to in life beyond menial jobs, crowded living quarters and poor sanitation. It’s heartbreakingly sad, and all we can hope is that we bring a little seed of joy into the lives of those we work with. From our perspective the tour has exceeded expectations across the board – in each place the children and young people astounded us with their appetite for learning new skills and with their friendly attitude and openness towards a group of somewhat eccentric performers who descended on them with a very British sense of punctuality and structure. Fortunately there were two quick realisations on our part which made everything run smoothly. Firstly, we adjusted our Britishness to a more Latino outlook – as flexible and open as possible, and letting the tour happen to us rather than pushing to make it work exactly the way we had planned. Secondly, as we spent more time in each place we came to realise that eccentricity is not just for circus performers; the organisations we were working with were headed by individuals who are incredibly passionate, fun, intelligent, driven, absolutely in love with music, theatre and circus, and just a little bit crazy to top it off – exactly what we were looking for! Our mission was slightly different in the three places we focused upon. 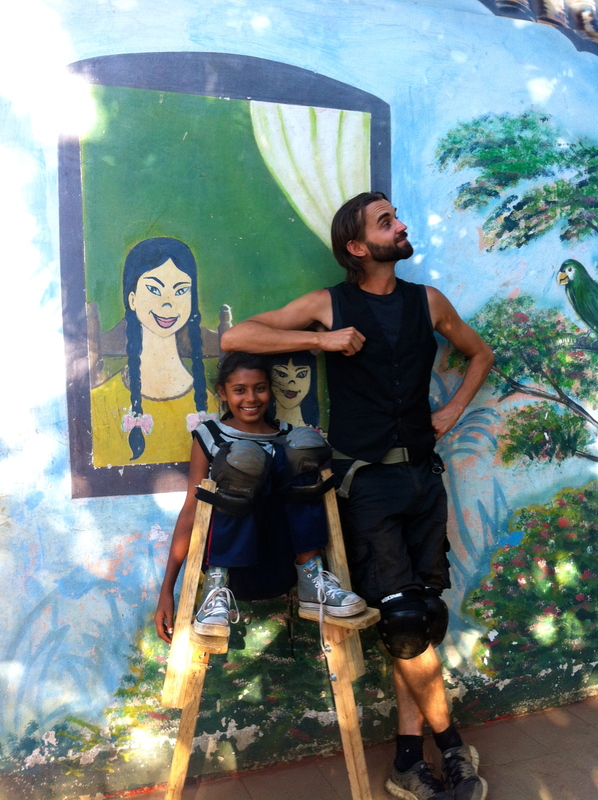 In Granada at La Escuela de Comedia y el Mimo we were working with children and young people who already have a knowledge of circus, and we were looking to give them new skills, as well as helping the school with some new ideas for how they can work as an organisation. Although we wish we’d had more time with them, it was still a great success – the young people in the core and learning groups showed a progression that was astonishing in the short time we had with them, and the organising team were very open to ideas of how to develop their festival and their funding strategy. We wish them the very best of luck for both in the future, and can’t wait to come for another edition of El Berrinche Ambiental. 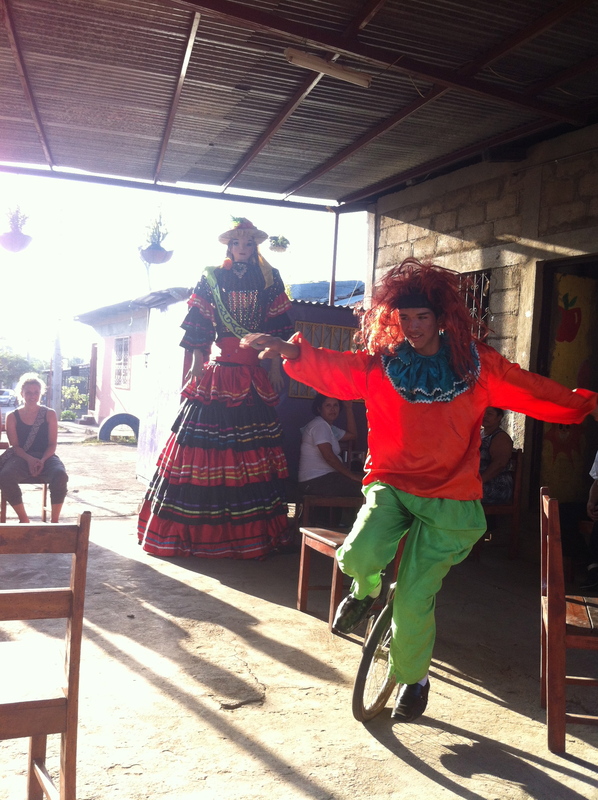 El Barrilete in Léon was an entirely different prospect – it’s a youth project working with around 120 children from 3-18, with one lonely unicyclist among their number. Although they have some cultural activities, their main focus is as a homework and vocational skills centre; taking kids off the streets and away from child-labour situations. They took to circus incredibly quickly, and by the time we left were already incorporating it into their regular performance group – they now have stiltwalkers, acrobats, hula-hoopers and jugglers to present alongside their beautiful traditional dances, comedy sketches and giant puppets! In San Marcos, it seemed as if all of the things that could go well for a PWB project turned up at the same time in the same place – including hugely enthusiastic partners from Asociacion Los Quinchos as well as focused and dedicated kids, eager to soak up as much as we could give them in the time we had. The climate there was a little friendlier too, and we all revelled in the semi-rural beauty of the Barrio we lived in – after a month of Léon’s hot and bustling streets, a 2km walk to a 14 acre finca where you can pluck ripe mangos from the trees certainly puts you in a good mood to teach! Once again, the speed at which the young people learned was incredible, and the skill on display during the final show was mind-blowing after just 3 short weeks. In the time since we left, we’ve been really happy to hear that they are regularly having circus practise, and have plans to put on several shows with their new-found talents. 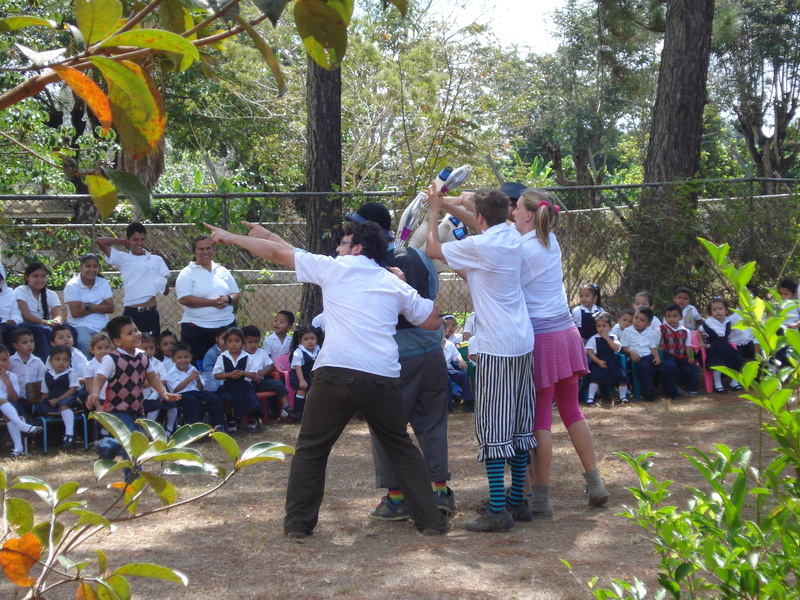 A PWB project isn’t just about the work we do with our main partners – on this tour we performed in many schools and projects in and around the areas we visited, and made hundreds of connections all over the country and across Central and South America. One of our big goals was to find out more about the national social circus scene, and to try to help it to develop and connect up in whatever way we could. This aim is more long-term than the instant fun we can offer through shows and workshops, but it’s also one of the best ways we can share the PWB vision and get as many kids from every walk of life involved in something we love. 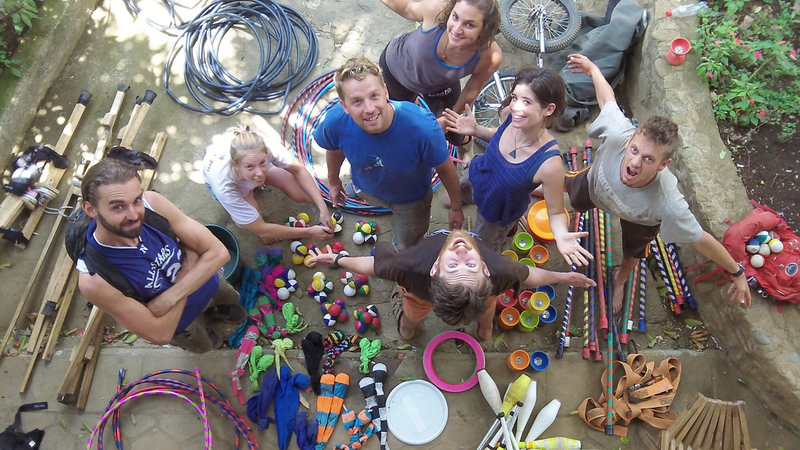 We’ve made some great steps both on- and off-project, connecting up various different organisations, donating and fixing equipment in project locations as well as to a few other groups, and generally making as much noise as we can about how great circus, theatre and music can be for kids. In total we taught around 200 children and performed for closer to 4,500 – a good target to aim to beat for future PWB tours! We’ve made a lot of friends in the last 3 months, and to tell the truth it’s proving very hard to leave this wonderful country. It’s just the beginning of what we hope to be a long and fruitful adventure for Performers Without Borders in Nicaragua, but it feels like the end of an era – already most of the team is back in the UK, and I have just one last visit to make to all of the projects before leaving the country. As Tour Co-ordinator, I’d like to say a final huge thank you to all our supporters far and near, to all the members of the team, to the PWB founders for beginning the whole thing, to all the organisations we’ve worked with over the past three months, and most of all to the children and young people we’ve met and shared with – you make it all worthwhile. Finishing the project more-or-less where we started in Granada at the school of Comedy and Mime (La Escuela De Commedia y Mimo) has an appropriate full circle feel to it. 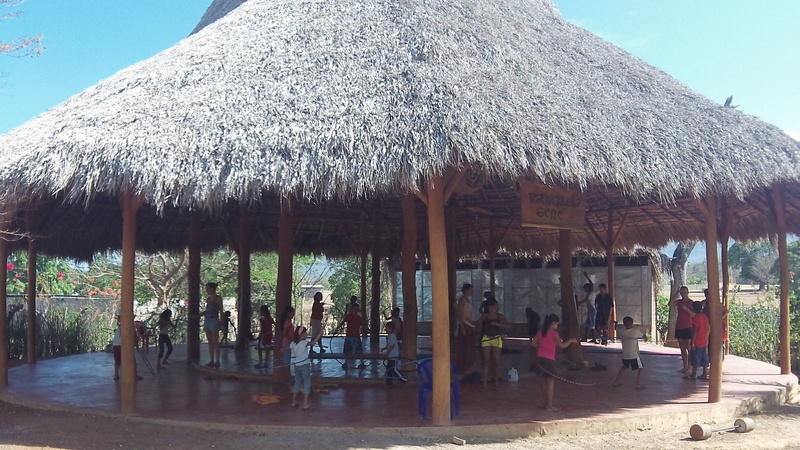 Returning to the festival site of El Berrinche to enjoy once again the Palapa play space and the ecologically built ‘Casa De Botellitas’ is the perfect end to this project. We have been in Granada for a week and half, doing what we do best – workshops, shows and playing! We arrived in Semana Santa – the week leading up to Easter. This is the big summer holiday week in Nicaragua before the rainy season begins. Granada was a hubbub of activities, christianity and tourists. We performed a show in the Cafe Theatre of the school on three consecutive nights to raise funds for the school. The first two shows were PWB Cabarets and the last was an amalgamation of routines from us and from the young performers of the school as well as performers from a new project ran through the school in a town called Esteli. The boys from Los Quinchos were a great help by advertising the show on stilts, and not only joined Bags and Tilly for a routine, but also took part in the massive acrobatic finale to the show! During the days of Semana Santa we were based in the school and had time to teach and play with these very talented groups of kids. Just to put things into perspective, 13 year old Brian can do back flips, juggle 5 balls and can pass 7 clubs on singles (juggler geeks out there you know how hard that is!)! It was a treat to have little structure for three days and to teach what the kids wanted to learn as opposed to having a syllabus. Skills these young performers chose to learn included poi and partner poi, slackline, hoop, club passing, 3 to 5 ball juggling, double staff, contact ball and acrobalance! We had two days off during which some of us went to Laguna Apoyo – a volcanic lake not too far away. As seems to happen in my time off – we found a project called ‘The Peace Project’ where they work with local kids – the leader of the project just so happens to be an ex-student from the School of Comedy and Mime! So yes, Jake and I managed to fit in another show and workshop in our time off! Wouldn’t have it any other way. We did manage to kayak around the beautiful Lake with the wonderful Matt from PWB – his fresh white skin from the UK was totally over roasted, burnt red knees despite the factor 50! Ouch! At the beginning of last week we started a new program with our days split into three. 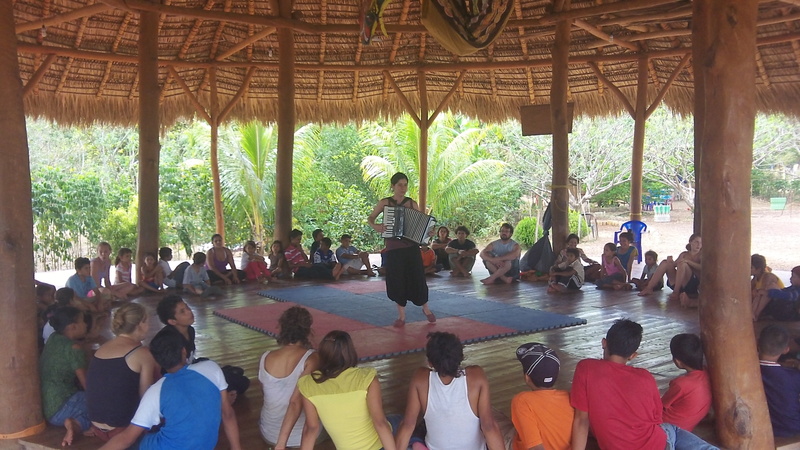 In the mornings and late afternoons we would teach the young professional performers from the school and boys from the new project in Esteli. These four boys came to Granada for the week to learn more circus to take back with them and pass on. They were introduced to circus only 7 months ago and already have an acro-clown routine and can pass seven clubs to name just 2 of their talents! It is amazing – I am learning to juggle clubs and I just cannot believe how quickly these guys progress! 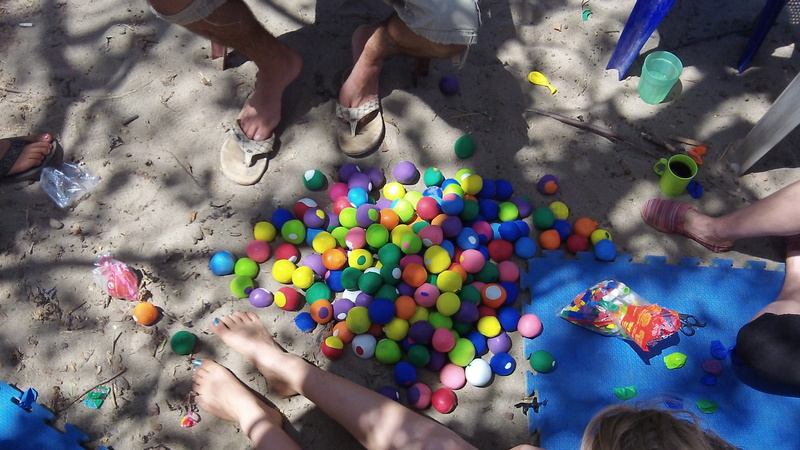 Or perhaps I am particularly slow – it did take me 7 years to conquer 3 ball juggling! In the afternoons we would teach approximately 40 kids from the local neighbourhoods. These same kids come to the school of Comedy and Mime to eat lunch, do homework and play 5 days a week. This meant that they already had some circus skills for us to build on. At the end of the week the kids presented a skill that they had learnt with us and we had a small and very entertaining show by a group of hungry Spanish Clowns! To finish our time in Granada and indeed on the project we had one last show at the Cafe Theatre of Comedy and Mime. It was a great show with contributions from PWB (acro-staff, The Hip Hop Hoop Off, contact ball, acro and slack rope) and the young performers from the Escuela (comedy, mime, poi, unicycling, magic, acro-clowning,) as well as a combined diabolo act – Jake from PWB and Francisco from the school. The act that totally and utterly stole the show was the finale by the young people! We are talking various three people high pyramids and other shapes – one person basing 5 people at once (a 6 person dragon – does that mean anything to you? Let your imagination run wild), jumps and backflips over and under other people doing rolls and tumbles and handstands! Remember these kids are aged from 8 to 16 – I have been having some small lessons in acrobatics from them! This brings us to the present moment – it is the last day of the project – we are organizing the equipment to donate and packing up the PWB Nica Box. Tomorrow the strangest thing will happen to me – I will be a tourist. I am lucky as I will not be returning to the UK until June. My original idea was to go and see and travel and do and be in Columbia or other countries nearby(ish). Volunteering my last three months has been epic and profound on different levels. Obviously volunteering is a way to really connect with the society you visit and an opportunity to give and therefore receive. A chance to understand more deeply the culture and make human connections and friendships. I have little desire to chill for the next two months (although those who know me know I am not very good at relaxing!). I have already organized a show and a workshop on my way south to Costa Rica on Tuesday! I have been looking into more volunteering but in reality I think practicing some circus on a beach will be good for me – for a short while at least! 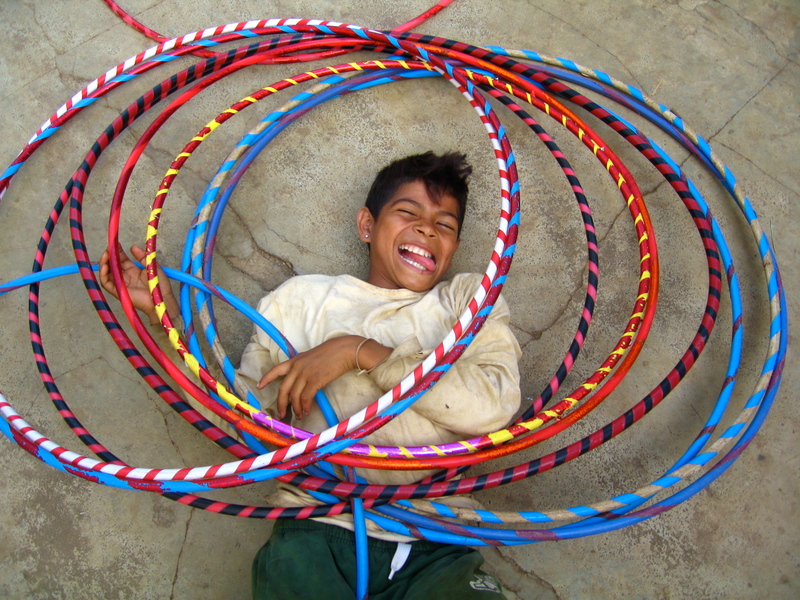 I will visit some of the other social circus activities in Central America and might look at working on farms too. 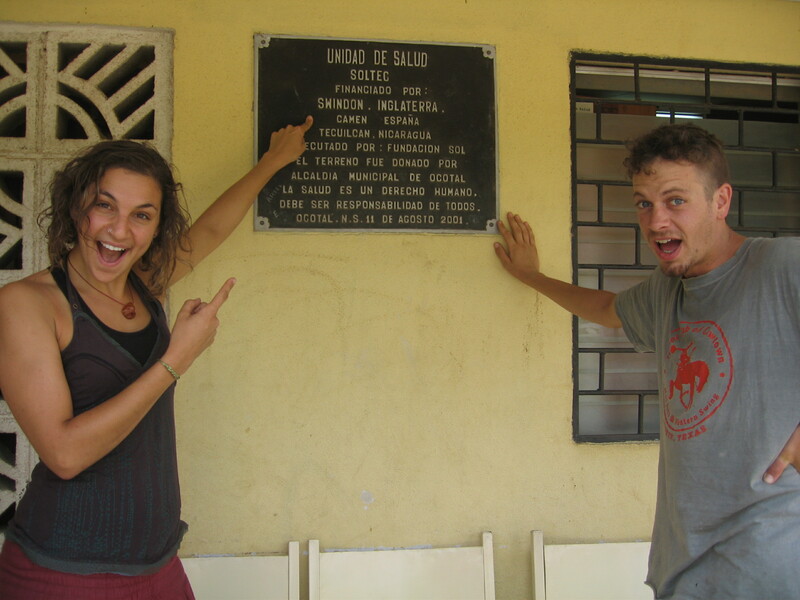 Volunteering abroad as opposed to traveling – that is a whole different blog! 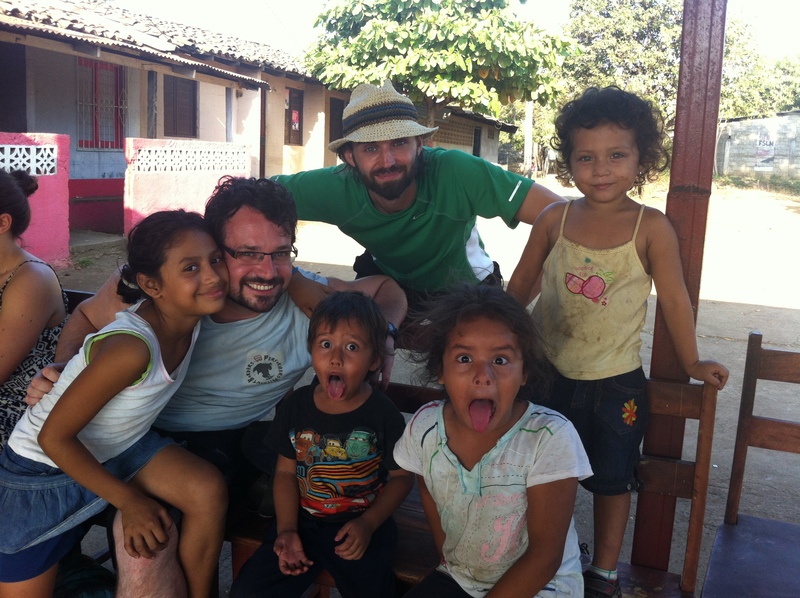 PWB Nicaragua 2013 – it has been an epic experience. It is all too true that you get out what you put in. This trip has sparked a relationship between myself and Central America and it is powerful to know that I can gift circus wherever I go. 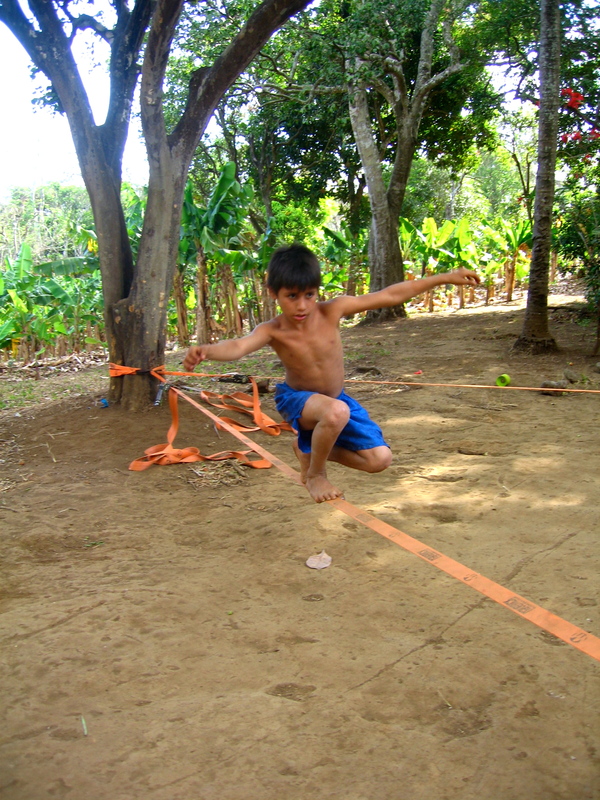 I hope that PWB Nicaragua will long continue, as from where I sit and sweat, this has been a tremendously successful project that has completely encompassed what PWB is all about…Seeing children grow in confidence, develop not only circus skills but teamwork and creativity, watching them achieve things they didn’t think were possible and through this become empowered to try more new things. 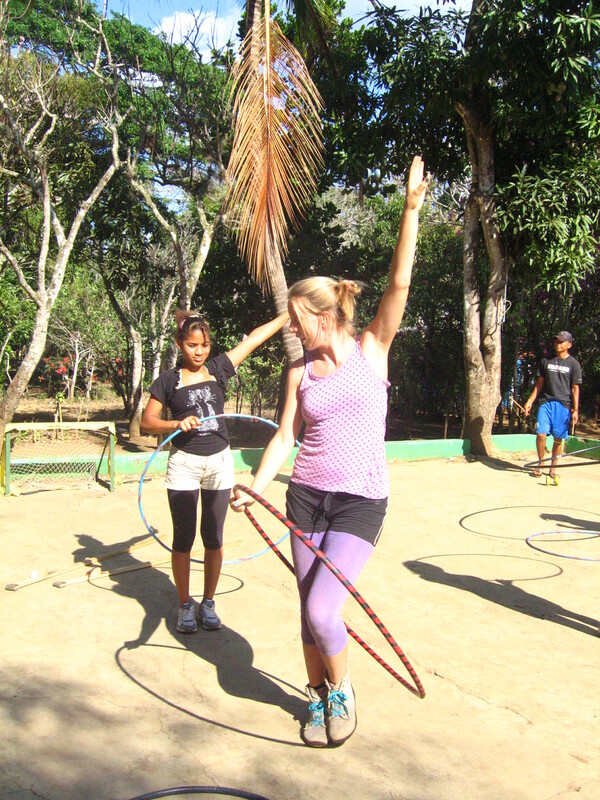 We have left them with the opportunity to further explore their potential through circus and have heard that children from both Leon and San Marcos have already performed or have performances coming up…I can’t wait to see what the next year brings, watch this space for Nicaragua 2014 news! After spending the last few weeks teaching all the Quinchos were more or less ready to perform the first ever ‘Circo Los Quinchos’. The previous 2 days we had been preparing and working with all the children on their various acts, everything from a well rehearsed and impressive acrobalance act and human pyramids right down to the youngest boys practicing their plate spinning and hand held stilts skills. The Italian colored circus tent at the back of the Los Quinchos pizzeria was busy with kids arriving, last minute rehearsals and getting glitter onto their faces. 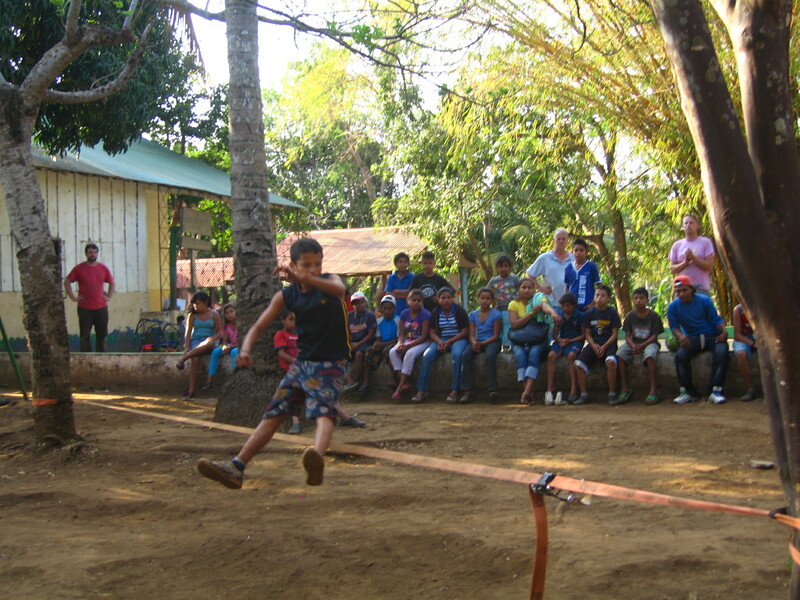 Starting about half an hour late – right on Nicaraguan time – the children were ready to perform to each other, the staff of Los Quinchos and some visitors from the US. After warming up the crowd, we kicked off with a hoop act by some of the girls…followed by so many more talented and amazing acts, about an hour and a half show in the end! It was incredible to see the kids perform after so little time learning circus, and there was some great and professional behavior – one of the boys who was on pizza cooking duty managed to perform two acts and still cook pizza in between! 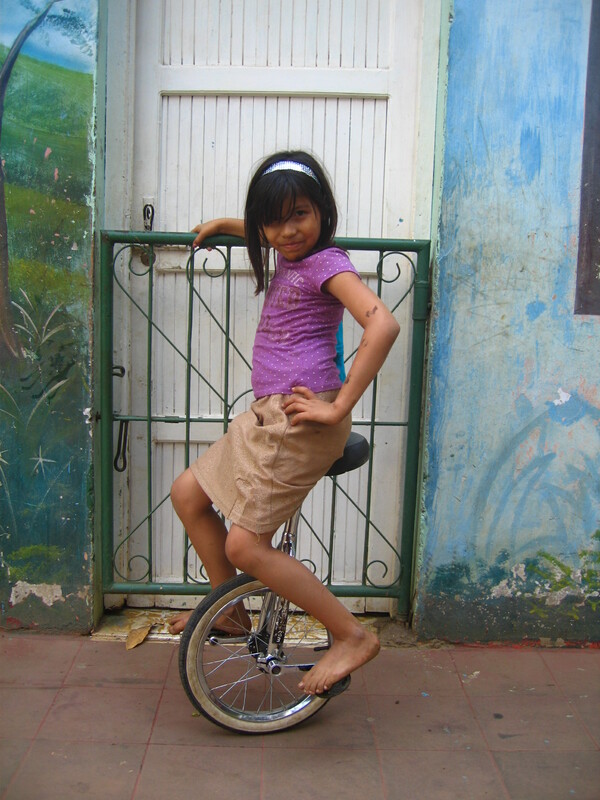 We had one student who had learnt to unicycle in approx. 6 hours of constant practicing and performed a great act even though he had hurt his foot the day before, and one of the boys who had fractured his wrist playing football performed his staff number with one hand! We also were treated to a dance number from some of the older boys ,and finished in fine style with a tumbling and pyramid number from all the girls. After some emotional thank you’s, goodbyes, and presenting the children with the circus kit we are leaving with them, it was time to pack up and get ready to leave. A few of us managed to squeeze in a last trip to the boys’ home to say a last goodbye and eat a last mango or 3…and then we were on our way! Although we were all sad to be leaving such lovely children, we were equally excited to be able to give two of the older boys the chance to come with us to Granada to the school there. Lazaro and Miguel showed an awe-inspiring enthusiasm for learning circus as well as an astounding knack for learning very quickly! Being two of Los Quichos’ educators already (for bread and hammock making) they were an obvious choice to give this opportunity, and they leapt at the offer of 3 more days of learning circus. So when the bus from the Escuela turned up to collect us, they were ready to go and helped us pile in our (seemingly never ending) bags and kit…and off we trundled towards Granada and the Escuela De Comedia y Mimo. Our days here in San Marcos begin with various wake up calls – the morning sweeping of the yard, the first bus to Managua honking its way up the hill at 5.30a.m, or children popping their heads in to say hi on their way to school at 6.30 a.m – school here starts at 7 for some of our students. It’s early to bed and early to rise in countries like Nicaragua – and India – where the middle of the day is so hot it makes it hard to do anything, and PWB’s volunteers adapt to this lifestyle throughout the tour. The PWB team roll out of their cocoon like hammocks or clamber down from their bunks and find their various ways to wake up properly – coffee, tea, breakfast, a stretch…Our ‘team mum’ reminds us we are leaving in half an hour for the first session of workshops, and we gather kit together and recap on the plan for the day before dividing up into 2 teams and walking opposite directions along 2km dusty dirt tracks to reach the girls and boys homes respectively. As we arrive we are greeted with smiles, hugs and ‘buenas dias, hola!’. Children make their way to the yard and join in our warm up games as they finish their morning chores of sweeping and cleaning and then workshops commence for the next 2 hours, with skills improving daily, and at quite an impressive rate. The kids have to get ready for school after our session – some have afternoon classes – so we finish and pack up, say ‘hasta manana’ (or Tom’s version, ‘pasta banana’, which some of the children have adapted with gusto) and make our way back to meet up with the other team of teachers. We regroup and exchange notes and experiences of how our morning sessions have gone, who’s learnt what and which progressions would be good for the next day. We have some time to ourselves to train – 5 balls, hula hoop, the splits, whatever takes your fancy – relax and eat lunch and then its off to our afternoon sessions for the children who have been at school in the morning. We meet back in time to de-brief about the sessions, chat about the plan for the next day over dinner and relax (or write blogs or edit videos!) for the evening. Weekends here are slightly different as the Quinchos who live in Granada come up and visit at the weekends, so we have some extra students and everyone gets to learn circus and play together at the boys’ home on a saturday. Last saturday we were lucky to be visited by Diego and 2 of his students from the Escuela de Commedia y Mimo in Granada, (we visited them at the start of the tour and we will also visit again at the end) who taught alongside us and then performed a show for all the Quinchos. It was received with many laughs and smiles, much clapping and even screaming from some of the girls who seemed to take a particular liking to Francisco who having attended the Escuela for 4 years is rapidly becoming a very multi talented 16yr old. Saturday evening is when the pizzeria is open, and we were asked to perform a couple of acts for the cliental- Francisco, Rob and myself were happy to help out, and I believe it is the only time I may ever perform to a remix of a Vengaboys song…. 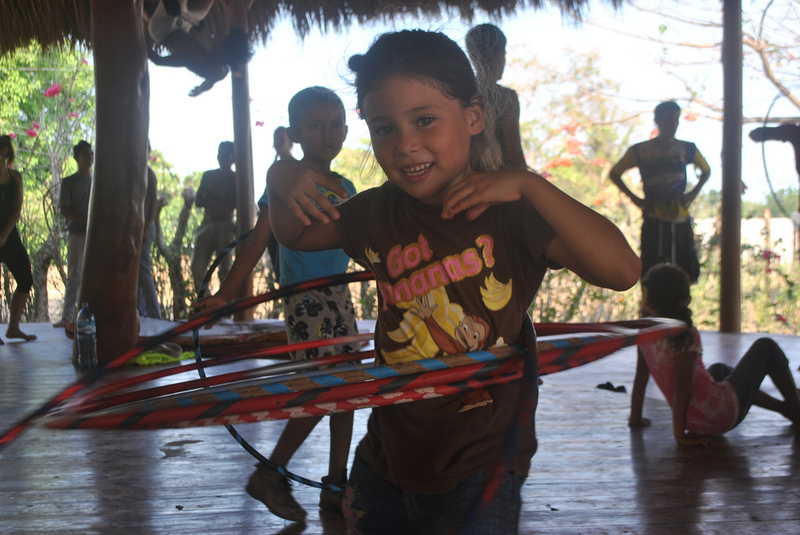 On sunday there was a further treat in store, as a small nicaraguan family circus had arrived in San Marcos and Zelinda decided to take all the Quinchos to it – and of course we came along too! The general verdict from the children was that the show was ‘Aburrido’ (boring), and that there were too many clowns. Indeed, half the acts were clown acts in rapid spanish which we understood in varying degrees depending on individuals grasp of the language! There were also some aerial acts, singing and dancing – but the children wanted to know where the juggling was and declared that our show was better – lucky us! As for me, I have to say that going to see a circus with 70 children is one of the highlights of the trip so far for me, it was so much fun. In spite of their verdict of ‘boring’, they were laughing and clapping for the whole show and I think it would be impossible not to have fun when you are surrounded by so much of it! Other memories that will stay with me and make me smile are some of the shows we have done where we have been asked for our autographs afterwards, which is funny, touching, and a slightly weird phenomenon. Lastly, after performing a show in the school that many of the quinchos attend, I overheard one of the girls proudly telling a friend of hers that she was learning circus from us…and that’s just some of what makes me want to carry on being a part of these projects! I’m very excited to be telling the children tomorrow that they have the chance now to make their very own circus show, and can’t wait to see what Zelinda thinks of it – she said it has been a dream of hers for quite some time to have a ‘Quinchos’ circus, as she herself is originally from a circus family…well, I hope maybe we can help that dream come alive for her…watch this space!! We arrived in San Marcos at noon on Tuesday the 5th of March. It was a high energy PWB re-union after our mid project break – all fresh faced and still buzzing after witnessing the awesome skills of the young circus performers of El Barrilete. What next? First we were introduced to our new home, the Chechio Bum Bum Cultural Centre, and what a bonnie house it is! 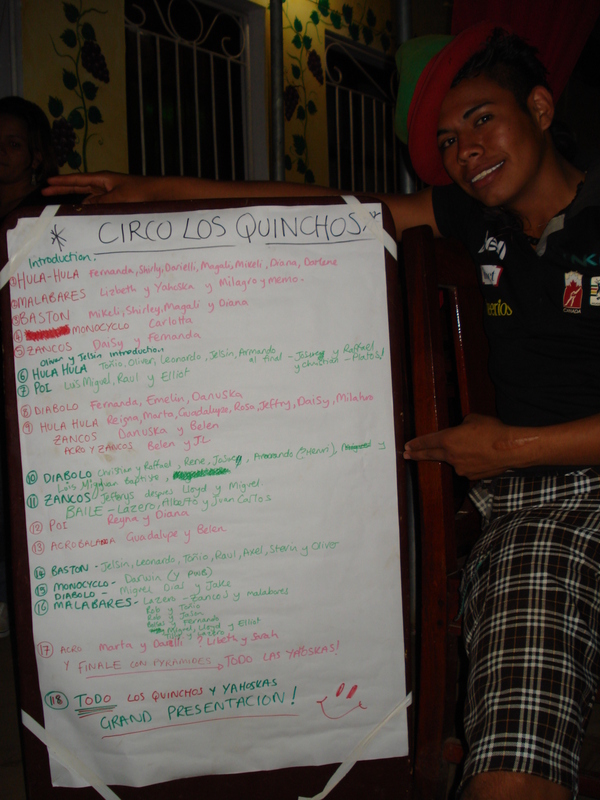 Next we were introduced to a surprise co-resident of our casa nueva – Memo, a juggling and poi teacher based in San Francisco, who has been working with Los Quinchos for several years and couldn’t quite believe his luck when the PWB circus descended upon him! Since sewing the seed, Zelinda and her amazing team of madres (mothers) and padres (fathers) have nurtured the growth of Los Quinchos and it is now an amazingly intricate network of homes and support. The branches of the project stretch across the country and it operates without a penny of Nicaraguan government funding. Awe inspiring. ‘El Filtro’ (the Filter House) is the root venue; situated close to Managau’s Mercato Oriental the house offers children food, washing facilities and medical treatment. The children are also encouraged to participate in sport and cultural activities and are signed up for school. 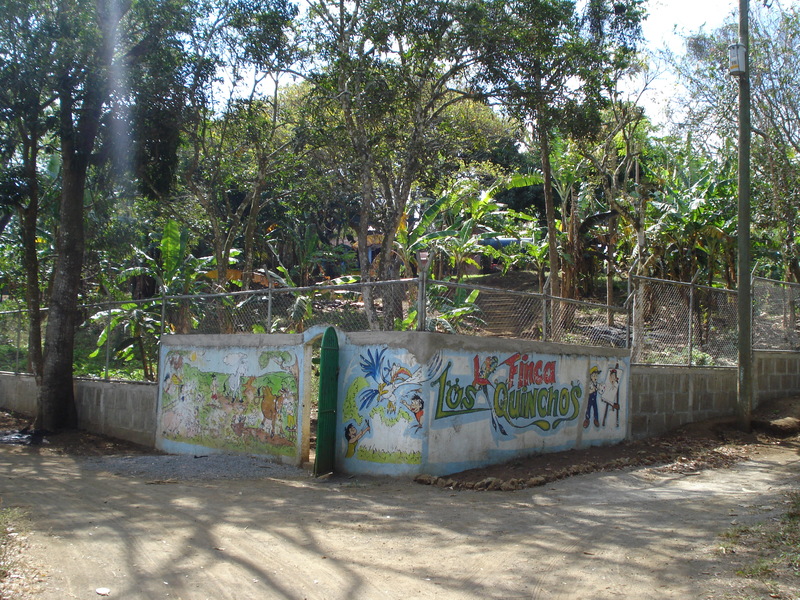 After some adaptation time in ‘El Filtro’ children come to ‘La Finca’ (the farm) and ‘Yahoska’ (the girls house) in San Marcos or to ‘La Casa al Lago’ (the house on the lake) in Granada, again they are enrolled in local schools. Until this month Los Quinchos also ran a project at La Chureca, the horrific 7kmsq dump by the barrio of Acahaulinca on the edge of lake Nicaragua. La Chureca was the largest open-air landfill in Central America – with 50% of its 1,000+ inhabitants said to be under 18. Mercifully the clearing of the dump has just been completed. It has been replaced by a recycling plant, offering employment, and 258 newly constructed cement houses provided by the Spanish Agency of International Cooperation for Development and the City of Managua. PWB are working at ‘La Finca’ and the ‘Yahoska’ until the end of March and what a joy it has been so far. 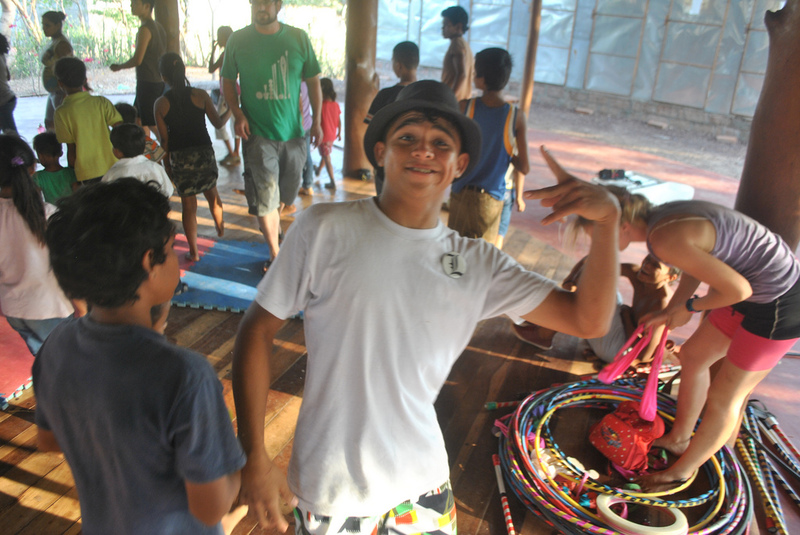 At the moment there are are around 30 boys aged 7-13 living at ‘La Finca’ and 24 girls aged 8-16 in the ‘Yahoska’. The children have rolling responsibilities for cooking, cleaning and general maintenance of their homes. What Los Quinchos has done for these children is immeasurable – providing security and companionship as well as education, responsibility and opportunity. Zelinda has built a micro community for her children in San Marcos. As well as the two houses there is the Cultural Centre, Chechio Bumbum and the Barrio House which consists of La Biblioteca, a library with internet café, and La Osteria, an Italian restaurant with performance space. When they are old enough the Quinchos are able to work in the pizzeria and in the office, earning money that is put into savings accounts for them. 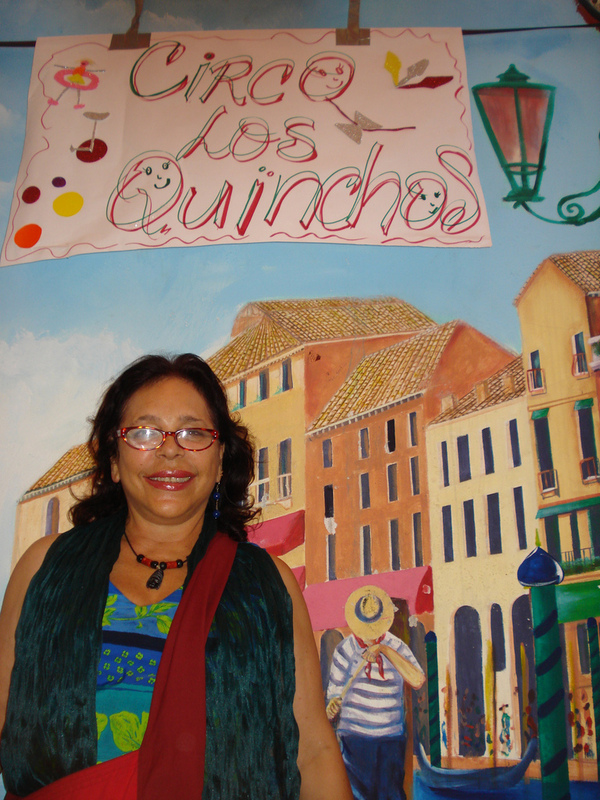 Older Quinchos members, educadores (educators), help with the running of the ‘Finca’ and ‘Yaoska’ and act as mentors for the younger and newer members. 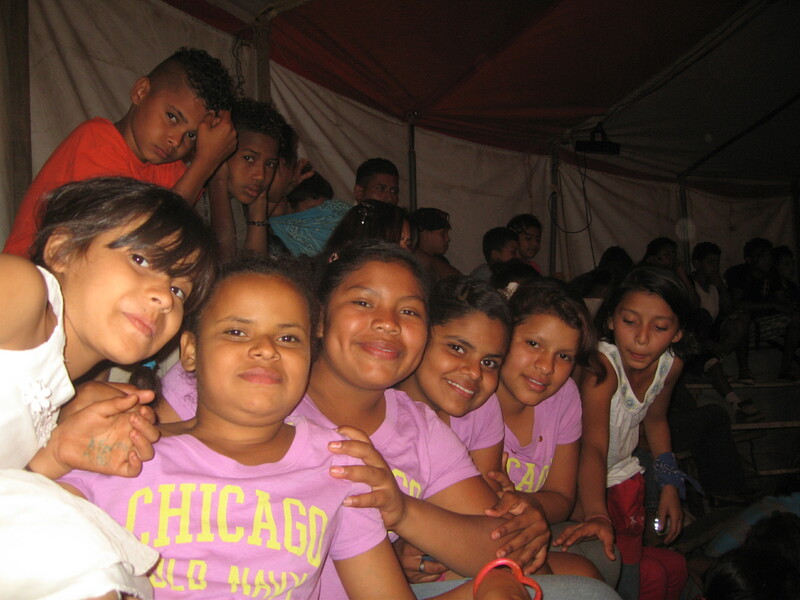 Los Quinchos has done so much for these children but has also brought so much to the local community. 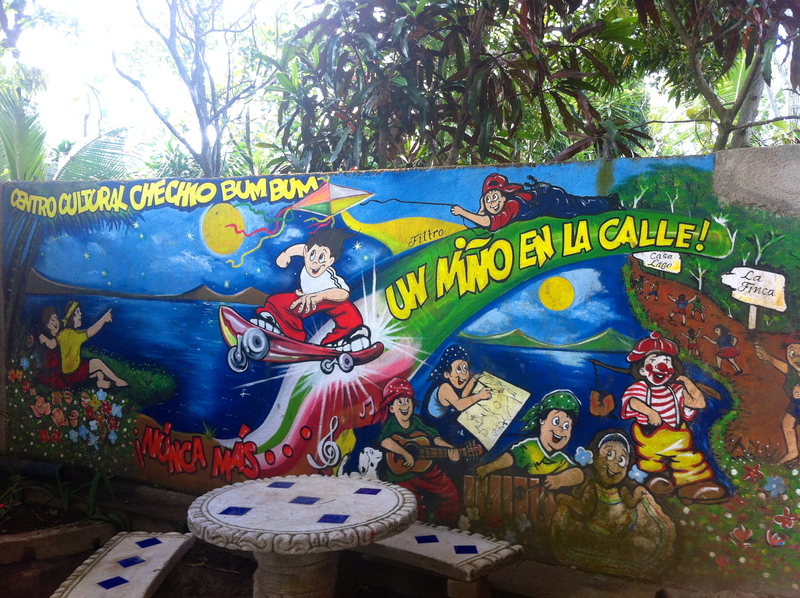 Any strain that an extra 50+ children might have put on local education resources was instantly abated by the genius idea of building the Barrio house opposite the school – the library and restaurant are frequented by locals and Quinchos together. Since arriving PWB have taught workshops and hosted open play sessions in both venues every day. 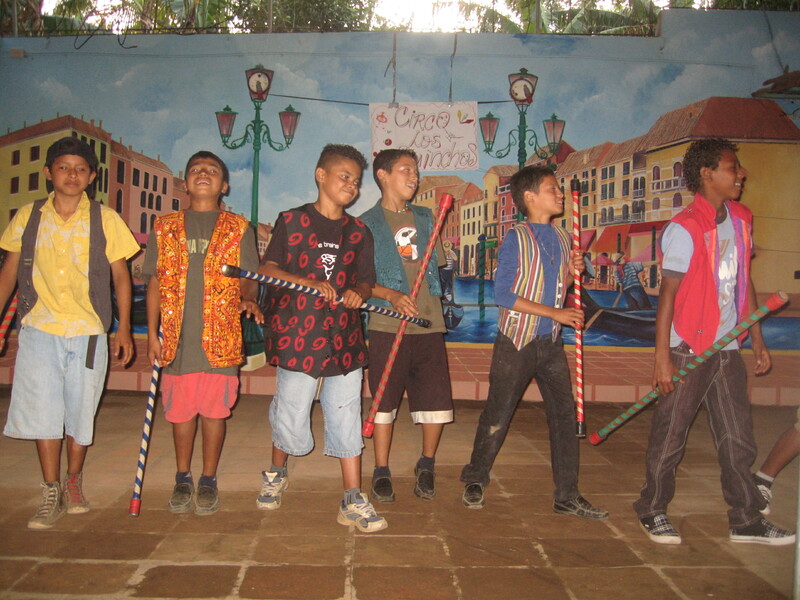 We have also managed to squeeze in a show for Los Quinchos in La Osteria and 5 other local school performances. The children visit us constantly at the house, just to say ‘Ciao’, and it is emotional to see them growing in confidence and determination in just one week. Their positivity is awe inspiring and also humbling and it is a privilege to be part of their lives for this brief period. I am really excited to see how the project will pan out. Watch this space. We have just started project number two, in San Marcos, and having spent the last few days marking the halfway point of PWB Nica. 2013 with a little break, here is a bit about my time ‘off’ with Jess, in Ocotal . . . Anyone who has worked and lived simultaneously with a group of people who you’ve never met in a country that you’ve never visited, teaching children who speak a different language, will know that it can be fairly intense at times. So having a few days in the middle of the project to appreciate some alone time, reflect on what has been, and prepare for what’s to come, is not only rather enjoyable but also fairly necessary! Some members of the group experienced the tourist life for a few days, some took the chance to have time with partners, however for me there was a mission on hand. In England I live (and have done for my whole life) in a town called Swindon. This town happens to be twinned with a town in Nicaragua called Ocotal and the two have a strong link through the SOL project (Swindon Ocotal Link). So this was my mission and at the last minute Jess decided to join me. And with neither of us having any idea what to expect but packing plenty of circus kit, we set off from Léon on a 5:20am bus to Ocotal. What awaited us in Ocotal was a surprise and a delight. It turns out that over the last few years the town has been visited numerous times by a group of circus volunteers from Germany and in their wake was a hive of skill and equipment. The project, called Biblioteca de Las Abejitas (Library of the Little Bees) initiated by the German volunteers, included a library and study space, and a circus prop room (full of amazing circus kit!) and training space. 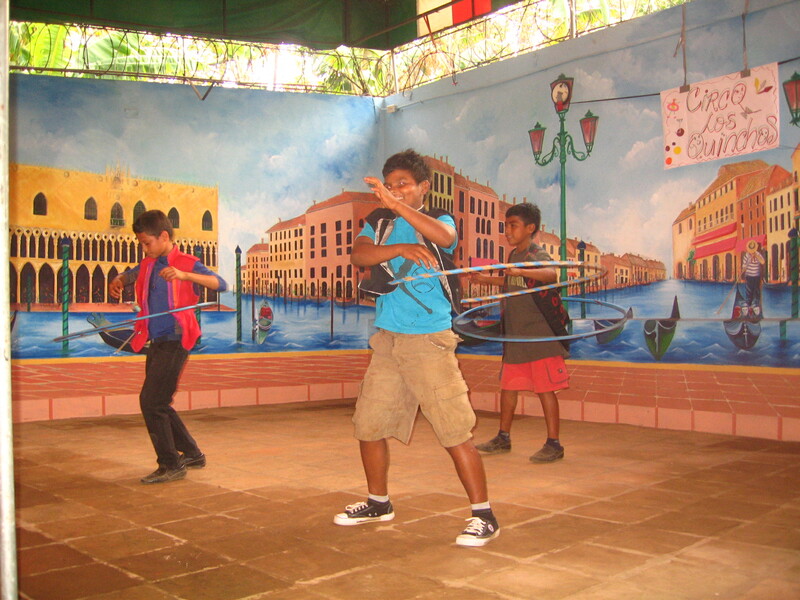 It is a place for any child/teenager in Ocotal to study AND practice circus! Our time off PWB proper was relaxing, invigorating and inspiring. 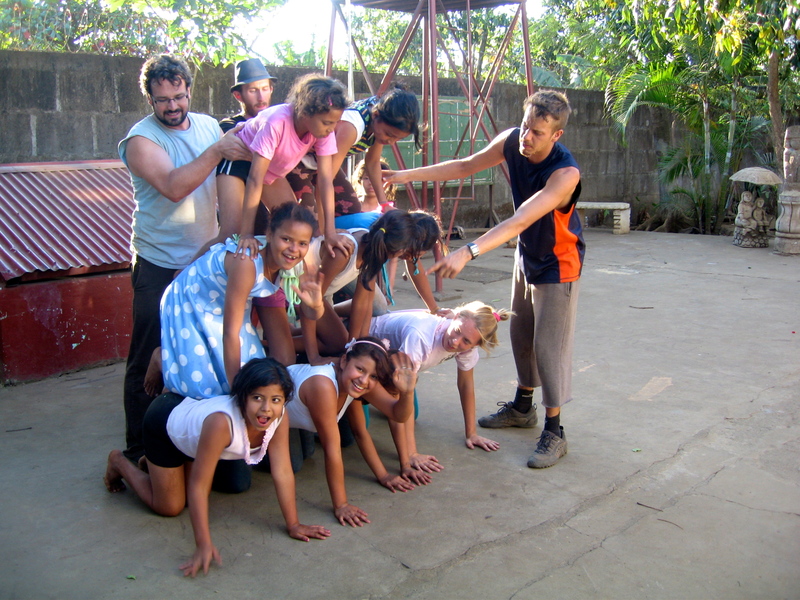 We spent it doing shows and workshops for Nicaraguan children. I guess you could say it was time ‘on’. I never thought I would ever be representing Swindon of all places and now I actually feel honoured and proud to have had this epic opportunity! On the bus to Ocotal Jake and I commented on how we literally had no idea what was awaiting us at our destination . . .
Our host Jorge had told us that when we arrive at the town we can ask anyone for him as he is a local Doctor and well known in the community – he was not wrong! The first person we met pointed to his car (which was driving away) and called him for us! The people of SOL welcomed us to Ocotal and into their homes, they fed and watered us (with rum) and showed us some of SOL’s projects as well as Ocotal’s nature and night life. SOL is a great project that helps with humanitarian aid in Ocotal. We visited a local health centre in the community which provides a great deal of care to over 5500 patients. We also saw a ‘comedor’ (eatery) in a school which provides free food for some of the children. As well as helping children and families, SOL also helps older members of the community with much needed care. 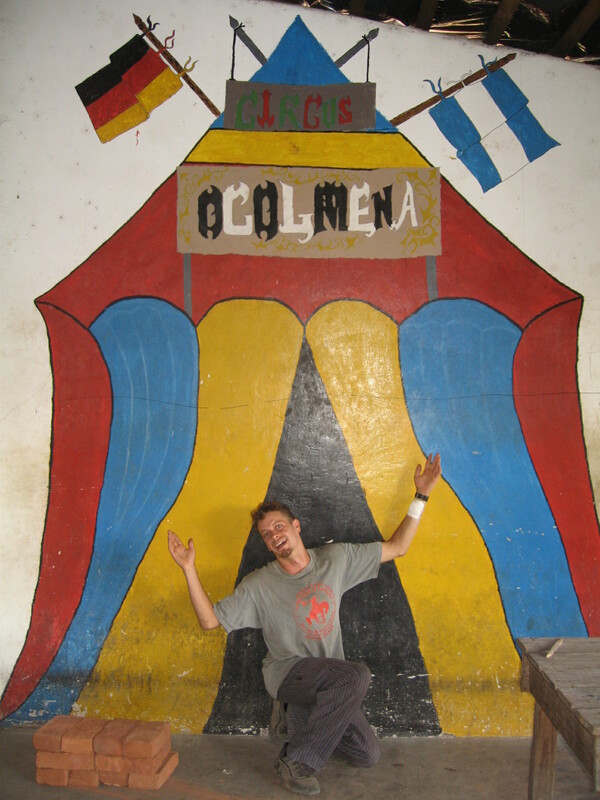 Jake and I were amazed and exited to find OcalMena Circus (Ocotal Hive) – a place where young people in Ocotal can practice circus 4 afternoons a week. These same young people are youth leaders in the community as they run circus workshops at ‘Casitas’ in different neighbourhoods around Ocotal. 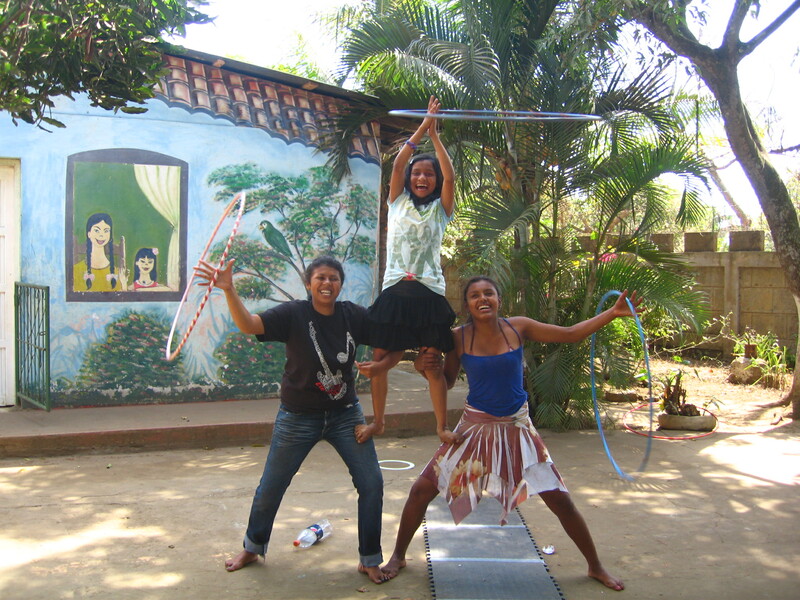 How incredible to find social circus in this small pocket of the world. It was very exciting for the young people and for me and Jake to be able to share our various skills with the kids. They soaked up the new skills and tricks we had to offer and were very grateful for the enthusiasm and inspiration. Jake and I wanted to ‘gift’ a show (this is a translation from Spanish back into English – and how beautiful it is) to the community (in the main park) and to one of the local schools where the comedor is located. We decided to call our little two person street-style show ‘Circo De SOL’…hehe! After the show in the park we passed a hat in support of SOL. Both shows were received very well, with the children at school being a particularly good audience! It sounds nauseating and cheesy but through the workshops and shows – as in PWB – we spread smiles, giggles, and inspiration and so when we came ‘home’ to our Ocotalian Grandmother-host we felt we had really earned her incredibly delicious food and coffee! One night we were taken for a family get-together by a new SOL friend. This was such a positive and cultural Nicaraguan experience including dinner, poetry recitals, rum, beautiful singing about Ocotal and Nicaragua, and story telling jokes, many jokes! I even managed to get the family harmonising one of my Jewish songs! Our hearts were filled with warmth by the way they opened their town to us and how they treated us like family – initially because of the Swindon link but eventually because we formed warm human connections. As this was our time off you may be pleased to know we did manage to fit in a trip to the local mountains were they grow and make coffee. We also spent an afternoon at the Somoto Canyon where Jake slack-roped above the water on the very same place as the picture on Nicaragua’s 50 Cordoba note! However, the height of excitement was when Jake got bitten by a dog – but don’t worry – he has had his vaccinations (I am referring to the dog)! 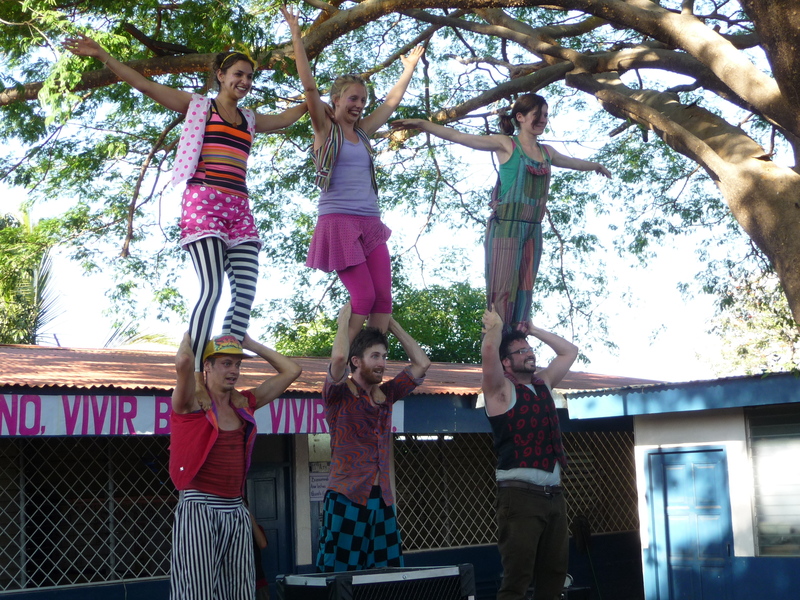 If anything, the trip to Ocotal enthused us even more about how circus can spread joy, ambition, teamwork, confidence, smiles, communication, and forge strong links and friendships. We feel ready to embark on the second project here in San Marcos to spread the PWB joy and we are sure that we will be returning to Ocotal one day. You are currently browsing the archives for the Nicaragua 2013 category.